Website and processes: 13 Jun 16 chris, 5/5 Excellent "Very easy to use the website, booking took a few minutes." 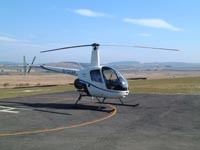 5 Hours of Dual Flight Training in an R22 Helicopter. Pre and post flight briefings included. The 5 hours can be counted towards your Private Pilot Licence.